NORFOLK, Va. - Dec. 22, 2018 - PRLog -- CIG Town Point Center LLC has sold the Town Point Center, a 12-story, 132,583 SF Class A office building located at 150 Boush Street in Norfolk, Virginia. 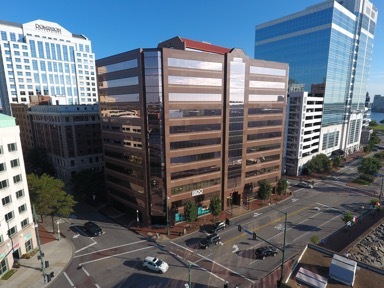 Town Point Center LLC, a private investor based in Baltimore, Maryland, purchased the premier downtown Norfolk building from an affiliate of Cohen Investment Group. Cohen Investment Group acquired the building subject to a ground lease in August 2014 for $14.5 million and sold the building and the underlying land for $19.9 million. Town Point Center is currently 95% leased. It has panoramic views of the Elizabeth Riverand boasts on-site amenities including a ground floor restaurant, fitness center, and penthouse conference center with rooftop decks. "Town Point Center remains an iconic downtown building with a premier tenant roster and convenient parking and accessibility to the full energy of downtown Norfolk. We are pleased to have achieved an outstanding result for our investors. We plan on remaining in the building for the next several years which is not only testament to our belief in downtown NORFOLK, VA but how much we enjoy conducting our business in the building." says Cohen Investment Group President, Hugh D. Cohen. Cohen Investment Group and its affiliated entities have participated in just under $200 million in real estate acquisitions and dispositions since July 2014 and own properties in Virginia, North Carolina, South Carolina, Georgia and Florida.